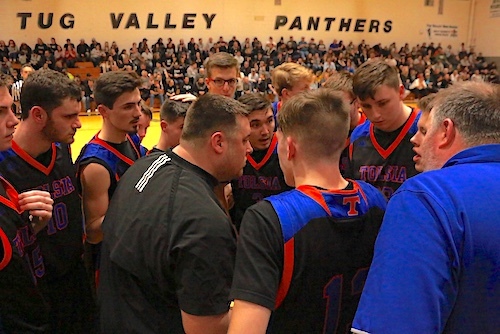 NAUGATUCK, W.VA. — Tolsia Coach Todd Maynard said it’s never easy after his Rebels blew a 7 point lead with :45 seconds left in regulation before escaping with a 75-70 overtime victory over Tug Valley in front of a huge crowd Tuesday. Zack Ball with the scoop shot for 2 of his 6 points against Tug Valley. Tolsia improved to 11-4 on the year but more importantly 6-0 in Section play and all but wrapped up the #1 seed in the Section tournament that will be played in late February. In a game that lived up to all the hype after the two teams played a 3 point game at Rebel Arena in December when Freshman Jesse Muncy hit a long three pointer to win it. Jesse Muncy splitting the double team for a basket at Tug Valley. Tuesday in the second meeting Muncy was even better as he poured in 35 points including 5 three pointers and 10-13 from the foul line. Muncy scored 19 points in the first half alone. After the two teams were tied at 16 after one quarter Tug Valley took a 4 point lead before Tolsia closed within 33-32 at Halftime. In the third quarter both teams went back and forth trading baskets before Tolsia regained the lead 47-45 heading into the fourth quarter. Coach Todd Maynard talking to his Rebels before overtime in Naugatuck. In the 4th period Tolsia stretched the lead out a couple times but couldn’t put the pesky Panthers away. 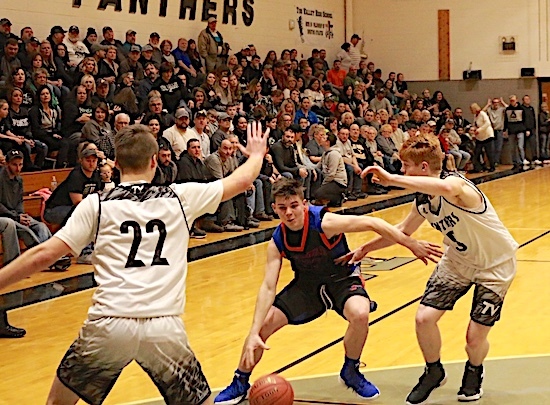 The Rebels missed 6 free throws in the 4th and Ian Reed of Tug Valley caught fire down the stretch with 3 three pointers including a long one to tie it up at 64 with 25 seconds left. Muncy hit 2 free throws to put Tolsia up before Zach Savage tied it up before Tolsia missed a long three pointer with the score tied at 66. In the four minute overtime period it was Tolsia out scoring Tug Valley 9-4 behind 5 points from Muncy and 4 points from Austin Salmons. Tolsia placed three players in double figures led by Muncy with 35 points, Austin Salmons tallied 14 points, Rob Cantrell netted 13 points, Zack Ball chipped in with 6 points and a team leading 7 rebounds, Gavin Meadows 4 points, Braxton Williams 2 points and Jacob Mollette 1 point. Tolsia hit 7 three pointers and went 24-40 from the free throw line. 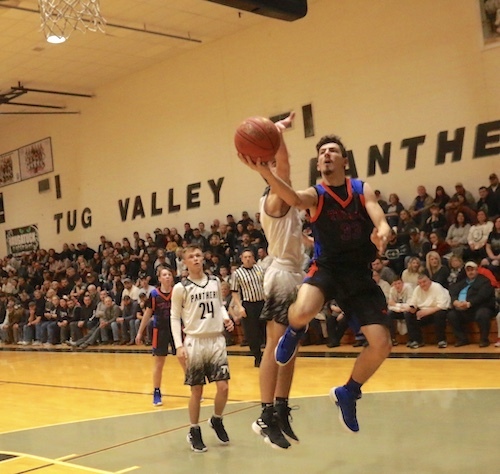 Tug Valley was led by Ian Reed with 21 points including 5 second half three pointers, Caleb May 19 points, Ethan Colegrove 12 points, Easton Davis 8 points, Tyler Chaffins 6 points, Zach Savage 4 points. Tug Valley hit 7 three pointers and went 11-15 from the line. The Rebels moved to 2-0 in the West Virginia Hometown Invitational Tournament and advanced to the Semifinals with the double digit victory Friday at Rebel Arena. Austin Salmons and Jesse Muncy scored 17 points apiece to pace the Rebels, Jacob Mollette tallied 13 points, Tyler Johnson netted 8 points, Gavin Meadows 3 points, Zane Sturgill, Zack Ball, and Steven Ward had 2 points apiece, Rob Cantrell rounded out the scoring with 1 point. Tolsia hit 6 three pointers and went 17-21 from the free throw line. Tolsia will return to action Saturday afternoon in the Semifinals of the West Virginia Hometown Invitational Tournament at #2 seed South Harrison. Junior Varsity at 4:00 and Varsity at 5:45. “… So proud of our kids for bouncing back after the game at Lawrence Co. over the weekend. 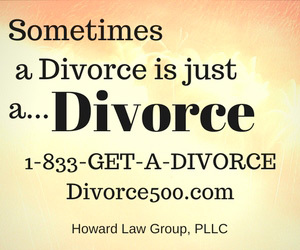 We put it behind us quickly and that is a credit to our kids.